One of the busiest Centennial committees in the province is the Turtle Mountain Centennial Committee at Killarney. For not only is the committee concerned with preparations for the Canadian Centennial in 1967 but it is simultaneously preparing for the anniversary celebrations of both the RM of Turtle Mountain and the Town of Killarney. Killarney, in 1967, will celebrate its 60th jubilee and the Rural Municipality will mark its 85th anniversary. One of the first projects undertaken jointly by the town and the rural municipality was the commissioning of a book - the history of the Killarney district. The author is Aileen Garland, a noted Winnipeg writer and a former Normal School teacher. 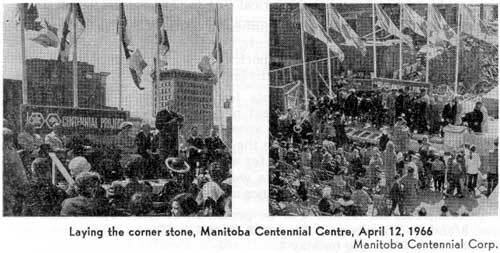 Laying the corner stone, Manitoba Centennial Centre, 12 April 1966. Among the highlights of the celebrations being planned is an "Old Home Week" to be held 16, 17, 18 and 19 July. The "Week" will begin with an inter-denomination service on 16 July. On 17 July a grand parade is to be staged. This event will be made more memorable by an exchange of floats with the Town of Boissevain which is also planning a Centennial parade. One of the most interesting of all the projects to be undertaken in the area is the erection of a humorously symbolic statue - a leprechaun astride a turtle - recalling the origins of Turtle Mountain municipality and the town of Killarney's Irish pioneers. The completed project will be shamrock-shaped, with a gravelled area and park benches. A grassy area will surround a circular fountain with the stem of the shamrock a spillway for water from the fountain to trickle back to the lake. The focus of this development will, of course, be the leprechaun and turtle. All of this activity has necessitated a large number of committees and intense organization. In addition to the Centennial committee itself, 16 subcommittees have been appointed and are at work. According to C. L. V. Britton, chairman of the Turtle Mountain Centennial Committee. there is still one more committee whose membership has yet to be named. It is the "Resurrect the Blarney Stone Committee" - a fair indication that Killarney and Turtle Mountain intend to enjoy their Centennial celebrations to the fullest. The Canadian Armed Forces will play a large part in Canada's centennial celebrations, by taking one of the greatest road shows in Canada's history across the nation. From St. John's, Newfoundland to Victoria, British Columbia, Canadians will have the opportunity of seeing the Canadian Armed Forces Tattoo which will be the principal contribution of the Services to Canada's centennial celebrations. This colourful spectacle will provide the ultimate in military entertainment within the framework of the development of Canada's Armed Forces from their French and British origins to our time. Scheduled to appear at 40 locations across Canada during 1967, the Tattoo will feature music, pageantry, colour, sweeping spotlights, history, action, comedy, fantasy and variety to provide entertainment while at the same time making use of a subtle historical line to link the various scenes. Throughout the performance, authentic costumes or dress uniforms including the weapons, accoutrements, and the music, songs and drill for the era depicted will be used to portray key and interesting activities of Canada's Armed Forces during the last three hundred years. The transportation arrangements for the performers call for two identical trains with a complement of approximately 250 performers each that will depart from a main assembly point in the Trenton-Picton area in April 1967, and commence the arena shows schedule. One train will proceed east to Sydney, Nova Scotia, for a performance at Glace Bay, Nova Scotia, and from there will commence its westward journey. The other train will proceed west after a performance at Barrie, Ontario. In Manitoba, the Tattoo will be presented at Brandon on 1, 2, and 3 May and in Winnipeg on 4, 5, 6, and 7 May. There will be two performances in Winnipeg on 6 May. 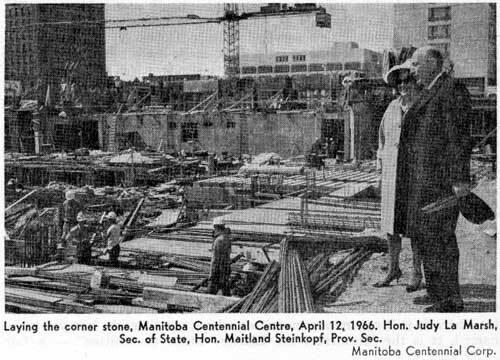 Laying the corner stone, Manitoba Centennial Centre, 12 April 1966. Hon. Judy La Marsh, Secretary of State, Hon. Maitland Steinkopf, Prov. Sec.